You know the feeling. You’re at the event, you know some people by face, they’re all talking and you want to jump in, but don’t know what to say, or how to approach them. That’s not just me, is it? 1 – The #CMWorld community is incredible. It wouldn’t be odd to jump on in to any conversation or group. Chances are, it’s how they became friends too. 2 – The networking opportunities are abundant. Come to the Rock Hall for the opening reception. It’s the best kickoff to the event because it’s really fun and a really amazing place, and it also has lots of space to spread out and have a conversation. Twitter Chat – You know who you are, our Tuesday at 12pm Eastern regulars to our #CMWorld Twitter chats! The liveliest and most inspiring hour of our week! If you haven’t met me or Mo Wagner yet – please do! 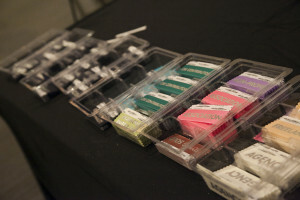 Agency – Any of our agency friends should grab one of these – you never know which brands at CMWorld will be looking to form a content marketing connection. Alumni – To our returning attendees year after year, please wear one! Both as a thank you from us, and also in case some first time attendees need some help navigating, we’d love for you to lend a hand and show them the ropes. Association – Wear it proud! Let us know that you’re an association so we can connect with you. B2B – For B2B marketers in attendance – probably our largest group! B2C – For B2C marketers in attendance – there are more and more of you each year – exciting! Best Actor – Have you been called this once or twice? Do you have a stage presence? Best Sense of Humor – Aside from your mother, have people told you how funny you are? Then this one is for you! Blogger – Please wear one of these if you are an active blogger. Connect with one another, and be sure to connect with us! And connect with Michele Linn and Lisa Dougherty as well! Class Clown – Does your epic content have a hint of humor in it? We think you should wear one of these. Content Strategist – Were you at ICC, or are you part of the content strategy community? This will help you locate each other. Contributor – For those of you that write for the CMI or CMWorld blogs – this is for you! Executive Forum – Over the past two years, over 80 executives from leading brands joined us for our CMI Executive Forum. We’ll put this ribbon inside your name badge for you! Flying Solo – Are you the only one from your company in attendance? Wear one of these so other attendees know to bring you along with their group. It’s a great way to find a conference buddy! Freelancer – Are you looking to pick up some new clients while at CMWorld? This is one way to get your name out there! See? We’re always looking out for you. Most Adventurous – Were you trying out new social networks before they were cool? Were you going out on a limb with some of your content marketing efforts, and proved everyone wrong? This might be the one for you. Most Likely To Succeed – Your content marketing strategy is documented, you have goals set up in Google Analytics, and you have an editorial calendar (that you actually use)? Just go grab one of these now, show off. PS: You probably should consider sending in a submission for Call for Speakers for CMWorld 2016. Most Well-Rounded – Your channel plan is focused, but you also make sure your bases are covered and you’re looking for new customers in new and fun places. Sounds pretty well-rounded to me. Nonprofit – We love what you do. Make sure we know that you do it! We want to know the faces behind your great programs. Online Training – Have you started (or completed!) our online training program? Let’s network with each other! Outstanding Personality – Well, let’s be honest, all of you should have one of these ribbons. Have we mentioned how much we love our community? Outstanding Leadership – You brought your team to CMWorld because you get it. You really get it. Your leadership will put you head and shoulders above your competition, and your team thanks you. Press – Thank you for covering our event! We’re glad you’re here. Let us know who you are! Speaker – Without you, we wouldn’t have an event. Thank you for sharing your content goodness and brilliance with our attendees. Sponsor – Like I said above, we certainly wouldn’t be here without you. Your support – financially and otherwise – makes our event the best it can be. PS – we love your teams and the energy they bring here! Staff – OK, now I just sound repetitive, but we wouldn’t have CMWorld – or CMI for that matter – without you. Make sure our attendees can find you! Vendor – Thank you for helping us run this event. The sound, the images, the everything! Thank you! Volunteer – All of the details you’re helping us with….we’re so glad you’re here with us. We’re looking forward to an exciting week! See you soon!